Despite threats from over-the-top services like Netflix, Amazon and increased use of web video and mobile alternatives, the big four TV network brands are top-of-mind and continue to stay relevant for TV viewers, according to the latest edition of our Must Keep TV Report. The seventh edition of the independent tracking survey is based on interviews with 1,400 American consumers aged 12-plus in early April 2014. The proportion of Americans who would include at least one of the big four networks on their ‘must keep’ list if they had to keep a small bundle was up 3 points from a low of 75% last year to 78% this year. The high water mark for this metric was 83% when SRG first started tracking in 2007. While the networks showed collective brand strength overall, the research found that the millennial generation continue to be less likely to want to include one of the big four in their top channels list – 68% did so in 2014, the same level as 2013, although much lower than the peak of 81% in 2007. ABC retains the top ‘must keep TV’ channel title in America for the total audience (aged 12-plus), followed very closely by CBS. NBC beat FOX to land at #3 for the first time since 2008. ESPN is again the top cable brand American TV viewers can’t do without, coming in at #5 overall and as the top cable brand. 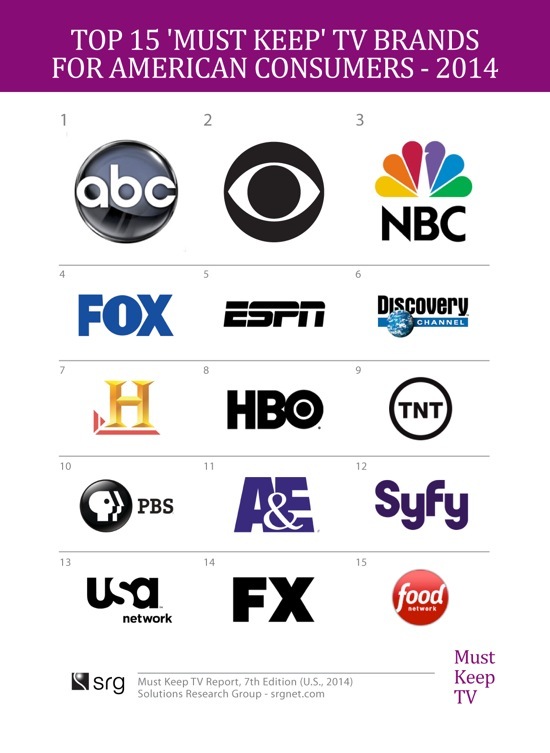 Discovery, History, HBO, TNT and PBS round out the 2014 Top 10 TV brands. Discovery regained its title as the leading non-sports cable brand in the country after losing it to History last year. FX was the leading momentum brand of the year, up six spots to #14, from #20 for full audience and as well jumping 5 spots among Adults 18-49 from #17 to #12. AMC also was up 1 spot from last year and an impressive 16 spots since 2012. It was ranked as the #14 ‘must keep’ brand for A18-49 this year, compared to a #30 ranking just two years ago. Top cable brands for Women 25-54 were: Discovery, Disney, Bravo, HBO and the Food Network. HBO made it to the Top 10 for W25-54 for the first time since 2009 in our tracking. While consumers’ relationship with TV brands continues to be strong, American consumers do not have as many actual TV sets in the house as they once used to. Only 50% had 3 or more TVs in the home in this year’s research, compared to 56% last year, 61% in 2011 and 65% in 2007, when Must Keep TV was fielded for the first time. The data also directionally suggests that TV brands that offer scripted dramas are seeing stronger consumer interest, particularly if they have strong archives of past episodes of their series available, or if past seasons are available on Netflix or on VOD for people to catch on and catch up with (not to mention availability via torrents). Before, people found character-intensive drama series more difficult to “drop in” on. They couldn’t follow the story, didn’t know the characters and only had time to keep up with only a few first-run series on a regular basis. The combination of greater availability of archives of show content online, including Netflix, and more comfort with the intimacy and flexibility of small screen Internet enabled devices, make immersion easier. Technical: ‘Must Keep TV’ tracking is an independent syndicated brand tracking survey conducted by Solutions Research Group (SRG) among a representative sample of American consumers. This is the 7th edition of the survey since 2007. The questions have been fielded and presented in the same manner each year. The 2014 research is based on online interviews with 1,400 American consumers 12+ conducted in early April 2014 – the sample captures and represents all major population segments.